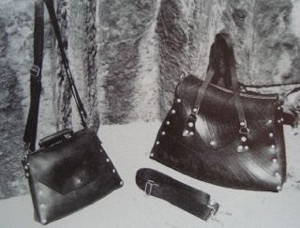 THE ORIGINAL INNER TUBE HANDBAG & WALLET COMPANY! Since 1984! Email usedrubberusa@gmail.com if you have any questions. We will send you a PayPal invoice and ship your order once we receive payment. Shipping is FREE. We ship priority mail 2 day. We can also ship international and will give you a quote for any extra charge. Thanks for adapting to our temporary no frills style! 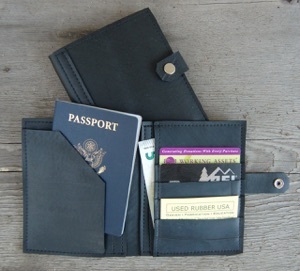 PASSPORT Wallet - $54 Great for traveling! 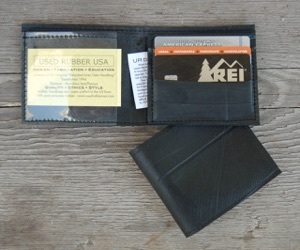 This one fits a passport, has pockets inside the front and back covers, room for tickets and receipts, and 3 wallet-style slots for credit cards. 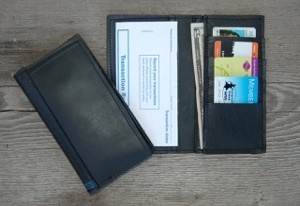 CHECKBOOK Wallet - $66 This checkbook wallet has it all. 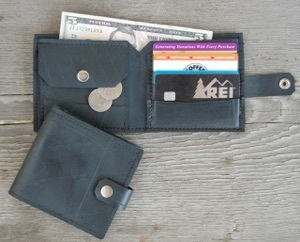 There is a large zippered coin compartment, two long pockets fit a checkbook and/or cash, plus there are multiple card slots if you carry lots of cards. 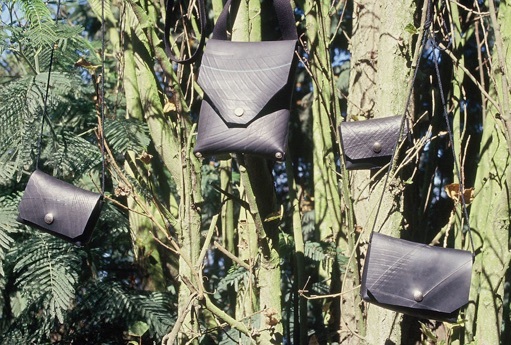 A snap closure on the outside keeps it shut inside your bag or coat pocket. 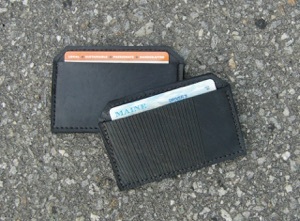 ID/CARD HOLDER - $16 The slim, flat ID and Card Holders pictured here is perfect for an I.D. and a few cards. It has one slot and easily fits in a coat or pants pocket. The V cut in the top makes it easy to get cards in and out. 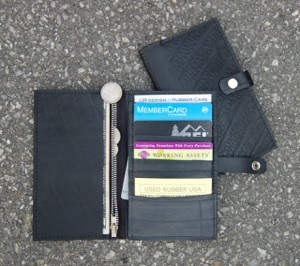 The Card Holder is all rubber while the I.D. Holder, has one side iof clear heavy plastic for easy viewing. Please specify ID or Card Holder when ordering. 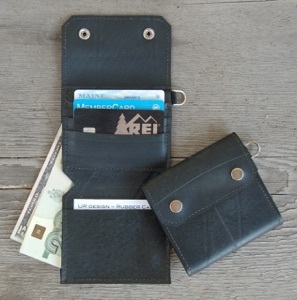 SNAP COIN Wallet - $55 The same style as our Standard wallets, but a bit larger, it has four card slots on the right side. 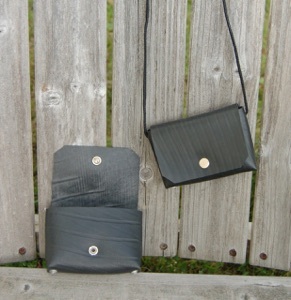 There is a snap coin pocket on the left, and another snap closure for the wallet itself. This style is popular with our European customers and those who travel as it is large enough to hold most European currencies as well as coins. 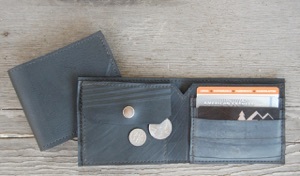 STANDARD COIN Wallet - $51 Same as our Standard Wallet but with the addition of a coin pocket. 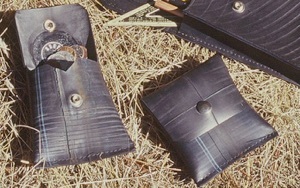 On the right there are three card slots, and on the left is a coin pocket with snap closure. There is a bill compartment as well. 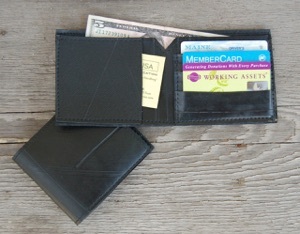 SLIM WALLet - $38 This is our favorite small wallet and you'll love it if you want to carry something more compact. 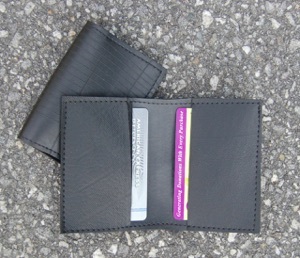 It is like the Standard but narrower with one pocket on the left, two card slots on the right, and a compartment for bills. Bills can be folded lengthwise or in half twice to fit fully into the bill compartment, otherwise they peak out a small bit. 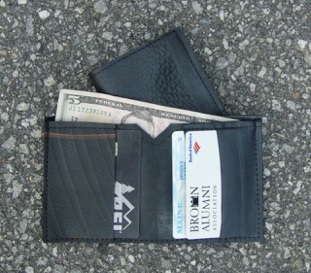 WINDOW POCKET Wallet - $47 =SOLD OUT! Has both the clear plastic pocket on the left, and an extra pocket behind the cards. Touring bag - $82 The Touring Bag is a great size for travel, it will fit a slim camera, small books, large phones, etc. Has a snap closure and an adjustable 1" wide strap. PASSPORT BAG - $56 Another one of our classic bags that has been popular for decades. This will fit a wallet, checkbook, sunglasses, or little extras. It is also a great size for the newer larger phones. Has a snap closure and 1" wide strap. 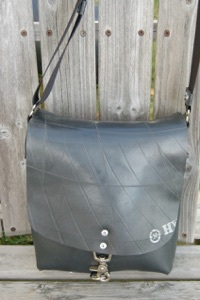 SQUARE CLIP BAG - $94 A very stylish, small profile, yet roomy bag. It's perfect for carrying books, notepad, wallet etc. 1" wide strap. VERTICAL SHOULDER BAG - $102 Half the width of the Large Shoulder Bag, the Vertical is a spacious medium-sized bag that's great for men and women. LARGE SHOULDER BAG - $182 Our largest bag, this one is great for use as a gym or book bag or anytime you want to carry more stuff. The front closures have rubber pieces that can be adjusted to allow the bag to accommodate a larger load, and clips which open and close the bag easily. 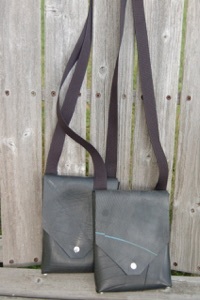 1.5" wide adjustable shoulder strap. KELLY BAG - $118 (On the left in the photo) A durable purse with great stylish design to take anywhere. This is one of our favorite styles and has been a long time classic. 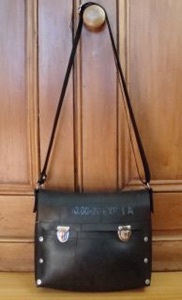 1" wide adjustable shoulder strap. MACPHERSON BRIEF (on right) is not currently in stock. Message us if you have a question. 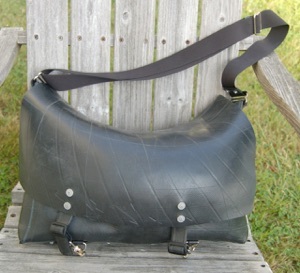 USED RUBBER USA pioneered the idea of transforming waste inner tubes into fashionable and durable products over 30 years ago. Since then we have been redefining the reuse of rubber and paving the way for others with our eco modern design, craft and education. 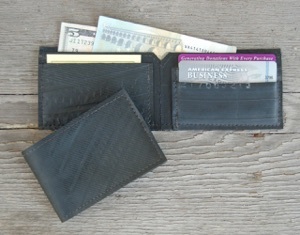 Our wallets, bags, and accessories are made in the USA from reclaimed inner tubes, a high-quality industrial rubber. 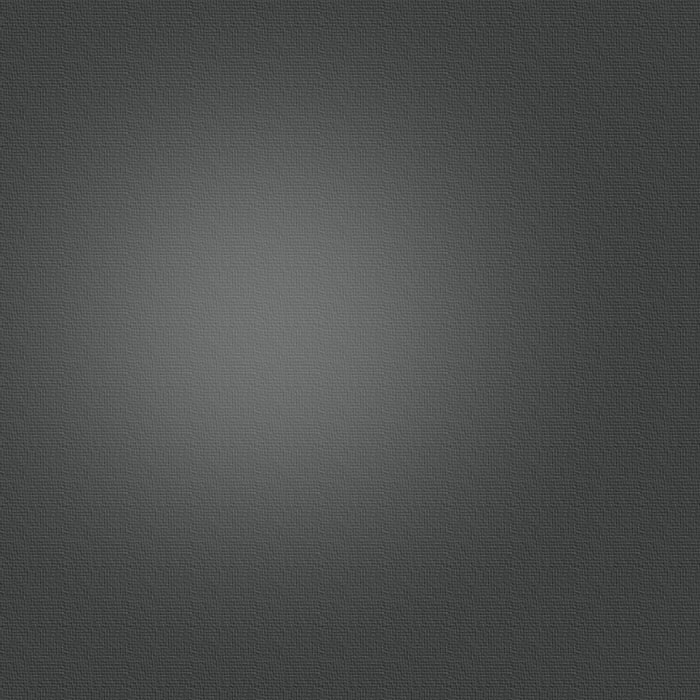 We work with waste truck, bicycle, motorcycle, and auto tubes. All of the rubber is post-consumer waste that we reclaim from the waste stream ourselves. The rivets on our bags look great, won't rust, last for ages, and make it easy for us to undo and repair sections of your bag if needed. 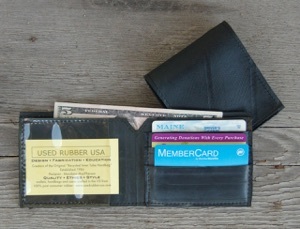 USED RUBBER USA products are for people who appreciate well-crafted design and for those who know that the consumer goods an individual buys have a direct effect on the environment. 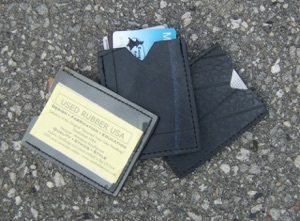 Read the USED RUBBER USA story to find out how we got started, where we're headed, and what we've done in the process. We hope you find our ethical, socially and environmentally sound business practices as exciting as we do!